"If you really want to make a friend, go to someone's house and eat. The people who give you their food give you their heart." This began with about two pounds of ground chicken. While it browned, I added a whole finely chopped onion. Then came a generous shaking of garlic powder, cayenne pepper, and black pepper, and a couple finely chopped habanero peppers. Once the chicken was virtually done, I stirred in a can of tomato soup. I then set it aside. 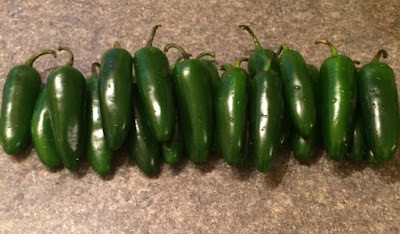 I washed 20 jalapeño peppers, having purchased the largest that I could find. These I sliced in half length ways and scooped out the insides to make 40 boat-shaped halves. 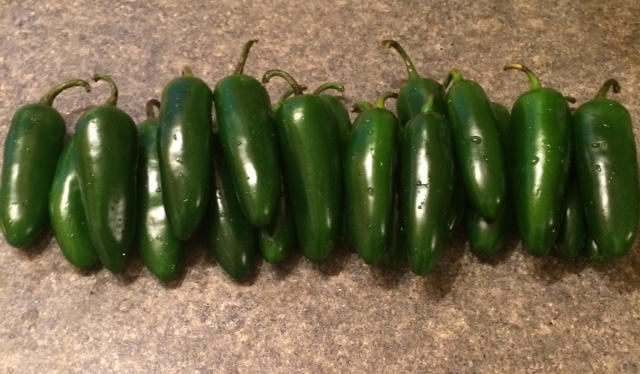 The seeds from the peppers I set aside to be used later to spice up the dip. 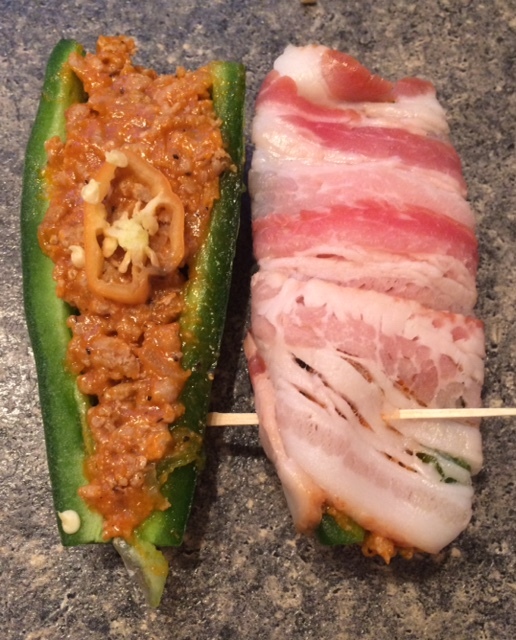 The pepper halves were then stuffed with the chicken mixture. A thin slice of habanero pepper was placed on each stuffed jalapeño, and then the whole thing was wrapped with a slice of bacon, holding it together with a toothpick. 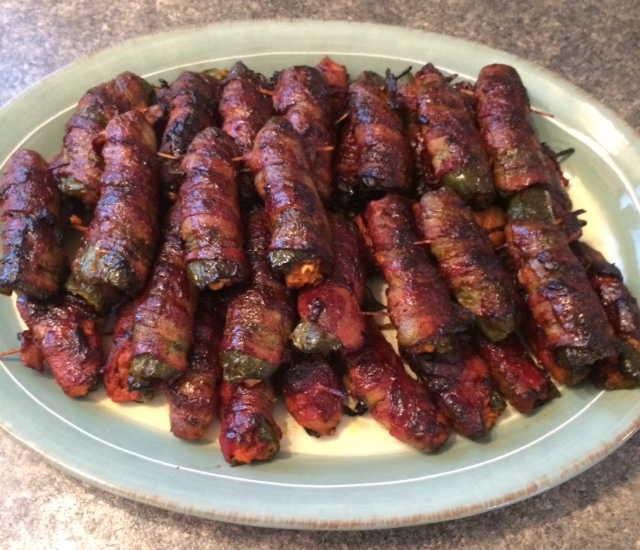 The stuffed bacon-wrapped peppers were then cooked in the oven on a raised rack to allow the grease to drip away. 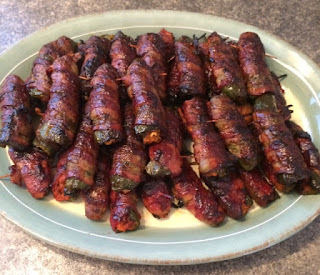 After turning them about half way through the cooking process to allow them to brown better, the peppers were then basted with some Bulls Eye barbecue sauce. The dip was a blend of Kraft Peppercorn Ranch Dressing, a tub of Philadelphia Jalapeño Cream Cheese, about three heaping teaspoons of Woodman’s Extra Hot Horseradish, and all the seeds from the peppers that I had set aside earlier. I served the dip out in small individual sized dishes to allow double dipping. 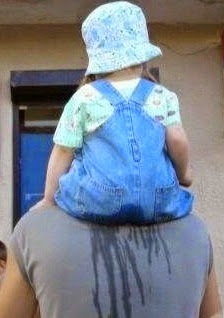 And that was about it. 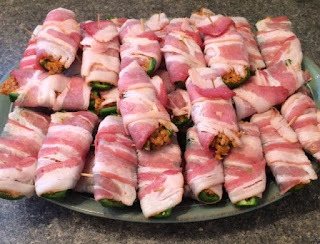 Nothing boring about this Super Bowl munchies dish. Now on to the game; Go Falcons!